Its name comes from the Greek word Rhein or "flow" and Lithos "Stone". This name was given by the German geologist Ferdinand Von Richthofen. It is a rock from the feldspaths family and it is formed by the volcanic magma presenting quartz crystals, feldspaths and amphibole. This type of magma mostly made of silica, can produce a glass rock when it cools down very quickly, such as the obsidian stone. With a slower cooling, there is a formation with multiple crystals that can give surprising patterns. The colors and shapes that you can get with this lava can vary a lot. The main colors of the rhyolite are green, yellow, toffee, orange, deep red and brown. This lava can create different effects like lines, bubbles, crystal layers… which can give very surprising stones such as the rainforest japser or the apache rhyolite. If the cooling is very slow, you can get a rock full of air bubbles giving for example a rock like pumice. The history and traditional use of the rhyolite are not well known, even if we know that it has been used for a long time. The rhyolite would help cleaning the kidneys and the liver, more specifically by reducing kidney stones. It would help fighting against viral skin problems. It would help fighting against aging. 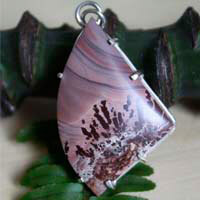 The rhyolite would help to a better absorption of vitamins.